Transform your kitchen into a trattoria by making your own ravioli. Whether you have fond memories of your nana's handmade ravioli or just wish you did, this DIY kit transforms your kitchen into a trattoria. Inspired by a trip to Italy, where she learned the ropes from an Italian cook in her Florentine kitchen, Carley Sheehy came up with a foolproof way to make the classic pasta. The kit comes stocked with pre-measured, dry ingredients and step-by-step instructions. Just pick up a few fresh fillings and basics from the provided shopping list, then roll, stamp, cook, and serve. Mangia tutti! Assembled in Livermore, California. Along her cooking journey, Carley Sheehy made it her mission to master cooking all the ethnic foods (from scratch) that she loved to eat. The actual cooking of new ethnic dishes made Carley feel adventurous and made her feel as if she was experiencing new cultures. She pursued her passion for cooking and fueled her adventurous spirit and ferocious appetite. Carley is thankful for being surrounded by many foodie family/friends that help her perfect her recipes (over and over and over again). Makes 35 ravioli. Serves four. This item is manufactured in a shared facility where all popular allergens may be processed. I wish I had the time to send this back and get another, but Christmas is right around the corner. We'll still try to make the kit, but will just make do with what we have. For $30, I really wish I had all of the truffle-infused oil. 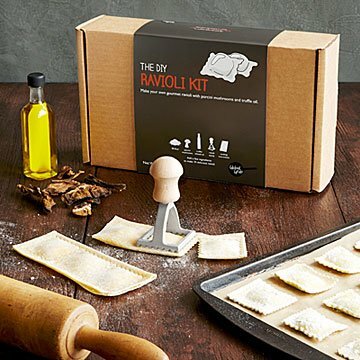 Great packaging, delicious ravioli, and a great activity to do with a loved one who loves to cook! The instructions were super detailed and they turned out so delicious! This is for anyone who has creative genes! This was used to create a wonderful meal from scratch.